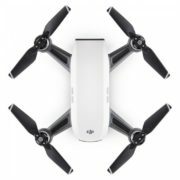 DJI Spark Fly More Combo (Alpine White) combines the Alpine White Spark quadcopter with the Remote Controller, Charging Hub and hub power supply, a set of spare propellers, propeller guards and total 3 batteries. In Tap Fly mode, just envision your shot and Spark captures it for you. Tap your phone screen and Spark, using vision technology, flies in the direction of your tap or exactly where you tapped while actively sensing obstacles. Capture shot after shot with just your fingertips. Spark automatically recognizes objects of different shapes and sizes then tracks them according to what they are and how fast they move. This makes tracking much easier and more reliable. 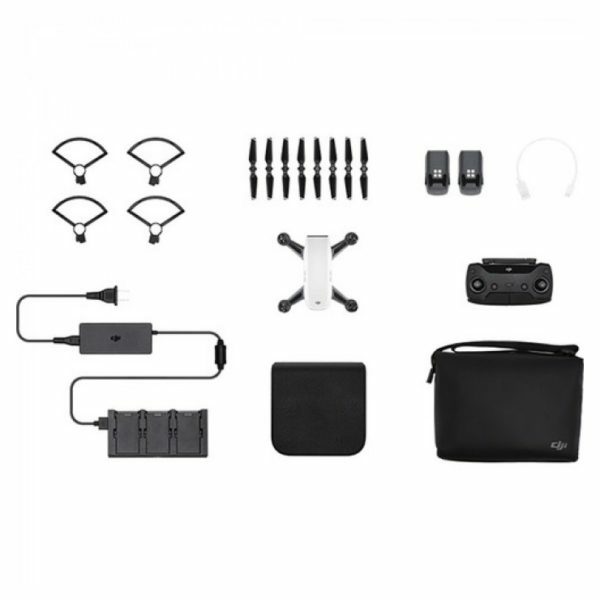 Gesture recognition allows you to take dronies with simple hand motions. With Palm Control mode, control Spark’s movement by hand. If you want, leave your remote controller and phone at home. Capture the World All Spark images are consistently sharp and vivid with very little color aberration and distortion. Spark’s camera has an f/2.6 wide-angle lens with a 25 mm equivalent focal length. Five elements are arranged into a single group that fit into a compressed frame. 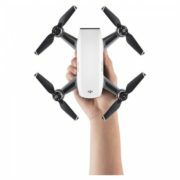 With its aerodynamic, lightweight, and slick design, Spark soars through the air with minimal wind resistance. The gimbal and camera are flush with the aircraft, significantly increasing stability. Powerful propulsion offers steady flight in strong winds at up to 31 mph (50 kph) in Sport Mode.2 And an advanced flight control system means flying is fun and intuitive. 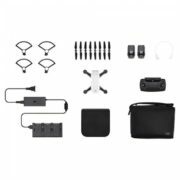 What's in the Box Alpine White Spark quadcopter with the Remote Controller, Charging Hub and hub power supply, a set of spare propellers, propeller guards, and a spare flight battery (for a total of two).